Aaron Kaufman, once a humble mechanic, helped launch a genre of car shows on the Discovery Channel with 'Fast N’ Loud.' Now he has his own show. And this time, it’s personal. Aaron Kaufman isn’t your typical car mechanic. There’s the beard, of course. That can’t be overlooked. There’s his status as a reality television star. He helped build an entire genre of car shows that started on the Discovery Channel with the 2012 premiere of the Dallas-based Fast N’ Loud, what has become one of the most popular shows on television, especially with men old enough to have a driver’s license. And then there’s the way he talks. Belying a childhood spent on the south side of Fort Worth and a diploma from Crowley High School, Kaufman sounds a bit like Owen Wilson. He has the same bizarre Texas drawl that has soaked overnight in a bowl of New England clam chowder—only faster. Too, he is inclined toward a formal grammar that looks British when it’s transcribed. Imagine Owen Wilson on crystal meth playing the part of a craft brewer in an episode of Downton Abbey. I suspect he will hate this characterization almost as much as he hated me the first time we met. We were standing on opposite sides of a stack of cardboard boxes in his new garage, called Arclight Fabrication, in an industrial area west of the Design District. The clatter of people working on cars filled the space. A Discovery Channel PR operative hovered over us, doing whatever it is that PR operatives hope to do when they hover over interviews in garages. I pressed Kaufman on why he’d parted ways early last year with Fast N’ Loud frontman Richard Rawlings, a separation that had rocked people who live in certain reality TV and automotive worlds. I gathered that he meant he wasn’t initially thrilled by the idea of talking to D Magazine for a story about his new show, Shifting Gears, which debuts this month, and that the brass at Discovery must have persuaded him to go along. His remark was intended as much for the PR woman as it was for me. He seemed on the verge of abruptly ending our conversation at several points. In an effort to spark his interest, I volunteered that I drive a Prius. I would say this tactic backfired, if the pun weren’t so obvious. “I don’t know you enough to be disappointed,” he said. “That might be the extent of your capability. I’m not impressed. I think you’re misguided. I began to suspect that Aaron Kaufman and I would never be friends. Good Hair Day: Kaufman says his signature beard just sort of happened, and if the Discovery producers ever told him he couldn’t shave it off—that’s exactly what he’d do. In the first episode of the apostrophe-abusing Fast N’ Loud, Kaufman and Rawlings find a decrepit 1931 Model A Ford that hasn’t run in God knows how long, and they have to get it fixed up and in cherry condition in nine days, in time for an Important Swap Meet. It’s an impossible task. A restoration and rebuild like this would normally take a year. The televised time compression signals to serious car buffs that we’ve left the world of reality, but it draws in casual viewers who like tidy narrative arcs that wrap themselves up after an hour of beards and bullshitting and blowtorches and paint jobs. Kaufman gets the old Model A engine running in short order, at which point Rawlings says, “Aaron can do anything. That’s why I keep him chained to this place. So no one can steal him.” Those chains, we now know, won’t hold. Another character introduced in the first episode: Scot McMillan Jr., a mechanic who has known Kaufman since high school. Midway through my phone conversation with him, five years separated from the one season in which he starred with his friend, McMillan had to hang up so that he could disassemble his kid’s Lightning McQueen bed for a Salvation Army donation pickup, which seemed about right. He now runs Scot Rods Garage in Fort Worth. McMillan and Kaufman met freshman year at Crowley High. McMillan lived in Benbrook, the next city over, and had a hardship license. Kaufman lived across the street from the school and had already modified a Jeep Cherokee Chief. Then the two teamed up and, using tools and materials from McMillan’s uncle’s shop, they put an air ride suspension system in an extended cab pickup, their first project together. Think lowriders, cars bumping and hopping, doing doglegs, one wheel in the air. Still in high school, the duo would drive their tricked-out rides to car shows as far away as California. And here a little time compression will do everyone some good. The Kaufman-McMillan duo couldn’t get a business loan because they were barely old enough to shave. McMillan signed up with the Marines. Meanwhile, Kaufman found his way to Rawlings’ Gas Monkey Garage and for several years traveled with Rawlings, 13 years his senior, entering races and car shows in an effort to promote the brand. Rawlings was the showman; Kaufman was the mechanic who kept the show rolling. But the best origin stories have a false start that ushers in the second act, and this one is no different. Gas Monkey Garage stalled, and Rawlings shuttered the operation, parting ways with his mechanic to go into home healthcare sales. Kaufman went to work at a place called 4 Wheel Parts. All seemed lost. And then the folks at Discovery saw a sizzle reel for a car show that Rawlings had been pitching for years. A young executive named Craig Coffman was put in charge of the show. The show’s format—buy a junker, rebuild it, sell it for profit—is fairly simple. The relationship between its two main characters is something else altogether. Rawlings wears V-neck t-shirts, complicated jeans, and multiple silver skull rings. He frequently does the devil horns sign with both hands, index and pinkie fingers pointed, while shouting, “Whooo!” The other half of the odd couple, Kaufman, meanwhile, looks like he’s preoccupied by an eBay bidding war for a torque wrench. The two of them, along with a fellow named KC Mathieu, nearly killed themselves that first season of Fast N’ Loud, building 12 cars in 24 weeks, turning scrap into showpiece, a feat never before or since accomplished. They worked sometimes 110 hours per week, compounded by commutes that piled on another 14 hours each week as they traveled from Fort Worth to Gas Monkey Garage, in northwest Dallas. Kaufman sometimes fell asleep inside the cars he was working on, as cameras rolled. He took showers with a hose behind the garage. In that first episode with the Model A Ford, when he does OTFs—an industry initialism for “on the fly,” when someone talks to the camera to explain what’s happening—Kaufman is clearly exhausted, barely able at times to keep his eyes open. In any case, at the end of 2016, fans of Fast N’ Loud learned that Kaufman was leaving the show. In the fuel culture of pseudo-reality television, it was as if Simon had left Garfunkel and, on the same day, Zayn had left One Direction. Beyond McMillan’s choice words, as to an explanation for the split, we have only oblique comments from those whose livelihoods still depend on the Discovery Channel. 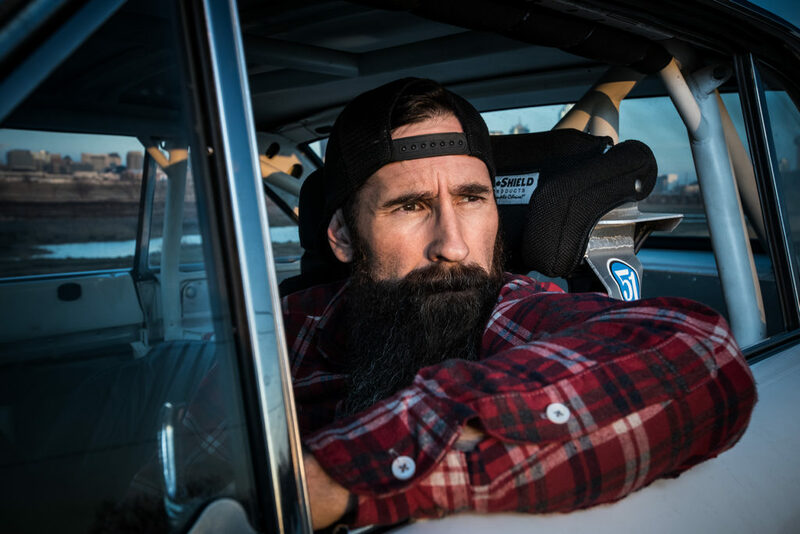 I had a second chance with Aaron Kaufman. A few weeks after our chaperoned, inauspicious meeting in his garage, I tagged along on the photo shoot for this story. He agreed to trailer his ’63 Ford Falcon up to a spot on the Trinity River levees where the skyline would provide a picturesque backdrop. He was kind to go to the trouble, especially given the pressure he was under in the production process for his new show. When I met him at Arclight and hopped into his pickup with him, he forgot he was still wearing a wireless microphone widget for the Discovery film crew. Days earlier, he’d had an emergency appendectomy and had taken only a couple of days off before resuming filming. He had trouble recalling exactly when the surgery had happened. Arclight’s long-term business plan entails manufacturing high-end parts to rebuild old Ford F-100 trucks, a market that Kaufman thinks is underserved. But in the short term he has to find a way to balance that business with Discovery’s demands for Shifting Gears. The show will bring him exposure that he could never buy, but it takes his time and attention away from the Ford truck fabrication business. Shifting Gears will reflect Kaufman’s more contemplative nature, it sounds like. First off, no complicated jeans and whooo-ing. Second, there will be fewer OTFs; Kaufman hates OTFs. The show will have a more documentary feel. It will be more real than that other show. Each project he tackles will progress through a three-episode arc: finding a new style of car to build (often requiring travel), doing the work, then racing or testing the vehicle rather than selling it. His first project will be a jacked-up truck with enormous tires built to compete in the King of the Hammers, in California, considered the world’s hardest one-day off-road race. After the photo shoot, I sent Kaufman an overly long text. “Our first meeting was less than ideal,” I wrote. “I shouldn’t have started off with a quip about you hating Richard. You don’t know me, and you couldn’t have known that I was kidding. That awkward start, coupled, I think, with the Discovery Lady hovering in the background, made things awkward. Honestly, I thought I got a better sense of what kind of fellow you are just from the shoot yesterday.” I went on to ask for yet more of his time, suggesting we meet for lunch. We made a plan to have lunch at Rodeo Goat on a Saturday, where I sat for an hour past our appointed meeting time before I texted him. Kaufman was apologetic and later explained that he’d been working from 6 am till midnight at the shop. He offered to meet for breakfast, then never responded to multiple texts asking where and when he wanted to meet. I picture Kaufman exhausted, asleep in his own garage, sitting in a cartoonishly outsize pickup truck while cameras roll. He tried to leave TV, but it wouldn’t let him go. For reality shows like his, Discovery shoots 100 minutes for every 60 seconds of edited show that make it to air. When Aaron Kaufman wakes up, I’m sure it will be great. Additional reporting by Zac Crain.